Long time no post everyone! Sorry for the delay…I have been super busy at my daytime job, but I have managed to sneak in a few crafty projects here and there. I know Easter has come and gone but I wanted to share a project with you which I am sending to the UK for a swap. If you have watched Martha Stewart lately, you may have seen a segement which featured some super cute pom-pom bunnies by Jennifer Murphy. I loved how retro and japanese inspired her project was and I simply had to try it! My swap partner adores bunnies, so it seemed like the perfect project for me to send to her. I wanted to stay away from the easter inspired bunny and focus on more of a modern sassy bunny. Say hello to Betty! She’s ready for a spring shopping spree. 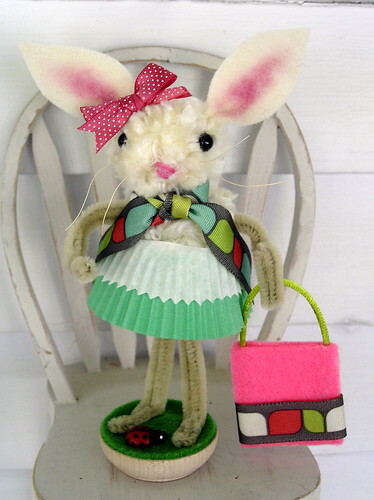 She’d made of wool yarn, pipe cleaners, some glass beads, muffin-tin skirt, ribbon, felt and a wood base. Betty stands about 6 inches tall. She took about 2 hours to make and I would rate the project as a beginner. I just sort of used what I had on hand to make and decorate her. I’m pretty pleased with the results. Look for a new featured Etsy shop soon!